The BG-C7 Battery Grip from Vello is a battery grip designed for use specifically with Canon EOS T3, T5 and T6 Digital SLR cameras, and accepts one or two LP-E10 lithium-ion batteries. With two batteries installed, your shooting time is effectively doubled. Moreover, when one battery is drained, it can be removed and recharged while you continue shooting with the other battery. The battery grip connects to the camera via a connection cable that plugs into the camera's shutter release port. The design of a battery grip offers a comfortable and secure way in which to hold your DSLR, especially in the vertical position. It will reduce wrist and hand fatigue when shooting vertically for extended periods of time. The BG-C7 has an alternate shutter release button designed for ergonomic access when shooting vertically and anti-slip rubber gripping to further improve handling. In addition, the BG-C7 contains a tripod socket, a strap lug for attaching a hand strap to the camera and a convenient internal slot to place the camera's battery door when the grip is attached. Box Dimensions (LxWxH) 6.1 x 5.0 x 3.3"
BG-C7 Battery Grip for Canon EOS Rebel T3, T5 & T6 SLR Cameras is rated 4.0 out of 5 by 31. Rated 4 out of 5 by Mudduck13007 from NIce Solid Battery Grip Purchased to photograph a convention for 6-8 hours so I did not have to keep switching batteries. Excellent solid design, it feels nice and comfortable in your hands. Easy to install and has a small compartment for your battery door. Only flaw for me, was the battery compartment has to much play, i accidentally put one of the batteries upside (which was a newbie mistake of course) but this should not have happened regardless because it's impossible to do this without the batter grip. Rated 4 out of 5 by ratwrf from Solid holds tight. purchaced grip to extend use, enlarge a small camera for my hands. Fits tight onto camera and lock screw has a spring so it can not be over tightened. Battery door stores in grip, great feature. With my tripod and hand grip I could not access battery without removal. Now I can change a battery without removal. Great! works with one battery installed only also. Rated 4 out of 5 by LuisVPR from Gets the job done! First off, Canon does not offer a vertical grip for this camera (Canon T3). It was not designed with that in mind so there is no internal interface for the shutter release or any other control. You have to use a cable from the grip to the remote shutter port in the body. Another thing to consider. The memory slot is within the battery compartment. This compartment is covered by the grip. So you have to either connect the camera to your PC to download the photos or remove the grip to eject the memory card. You have 2 options when looking for a vertical grip for the T3, Vello or Energizer. Do NOT buy the Energizer version. Get the Vello. Now for the good. You double the battery capacity. The extra weight also makes for a more stable unit, less vibration or wobbling when taking photos or video. The grip can be a little wide for small hands like mine but not bad at all. Rubber grip is good. Having the main dial as part of the controls would have been nice too but again...having a vertical grip was not part if this camera's design. So be happy there is an aftermarket solution for it. Unlike others, I do not find the plastic construction to be or feel cheap. Yes, I do recommend this grip! Rated 2 out of 5 by William D. from Not as good as I'd hoped It is necessary to use a cord connected to the camera that goes on the outside of the grip in order to use the shutter button on the grip. The button on the camera still works, so it's not a huge problem . . . it just seems like cheap engineering to me. Also, the overall feel of the product is cheap. It is also necessary to remove the grip in order to access the memory card. You can bypass this by downloading pictures directly from the camera. It's a major inconvenience, in my opinion. I wish I'd purchased a T3i instead. That way I could have gotten a Canon grip. Rated 1 out of 5 by Tim from Be careful So I just got this product, today, for my T6. Well, it doesn’t work with the T6. It’s only for the T3 and the T5. I tried with my old T3, and it barely worked. This is cheaply made plastic. The cap for the batteries pops out at random, the lock doesn’t lock into your camera. Do NOT buy! I will be returning this product ASAP! Rated 3 out of 5 by Jim F. from Vello BG-C7 The grip body is stout and fits will into large hands. The battery door is fragile and the internal springs to assist in battery removal are weak and do not eject the batteries. The thumb wheel to attach grip to camera has reduction gears. Upon first use, the gears stripped and the manufacturer suggested using a flat blade screwdriver to pry grip away from camera. Instead, I inserted screwdriver into thumb wheel slot and pried to avoid damage to camera body. The item was promptly returned to Vello. Rated 4 out of 5 by Anonymous from Gives the Rebel some oomph This is a good way to make the Rebel a bit sturdier. It allows for two batteries to be loaded, so if ones dies, the other one takes over. It is a bit light, and one has to be careful, because if you bump the battery door, it could come over. Overall, good value. Is it necessary to have a cord attached on the outside of the camera in order for the battery grip to work? I don't like the idea of having a cord on the outside that could catch tree limbs - not to mention the access doors have to remain open. Any suggestions? No, you are not required to attach the cable to the outside of your camera. The battery grip will work on your camera to extend the amount of time that you can shoot pictures. However even though it will vastly extend how long you can use your camera, in order to use the button on the battery grip you do have to put the cable onto your camera. I hope this answers most of your questions. How well does this fit with the Canon T6? It fits my T5 nicely with very little play. With the battery grip on, how do you access the memory card? The only way is to constantly taking it off.It is a headache but that is the only way to do it.Good luck. 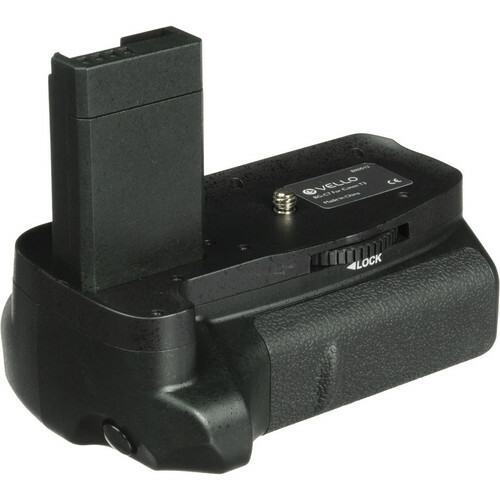 Is this battery grip compatible with Canon EOS 1100D? Yes the battery grip is compatible with the Canon 1100D. The 1100D is just another name for the T3. Is this compatible with the EOS Canon Rebel T3i? No it is not. They are different and not interchangeable. Can i mount the grip to a tripod? Yes, it can be used on any brand of tripod. I just bought a camera grip for my new canon T5. I do not like the idea of the shutter cable either. Are there any camera grips for the T5 that do not require the shutter cable to use the shutter button the camera grip? Unfortunately this is the only Battery Grip that we carry that will be compatible with the Canon EOS T5 Camera.